This wasn't so much about trying out a new recipe as trying out a new technique. 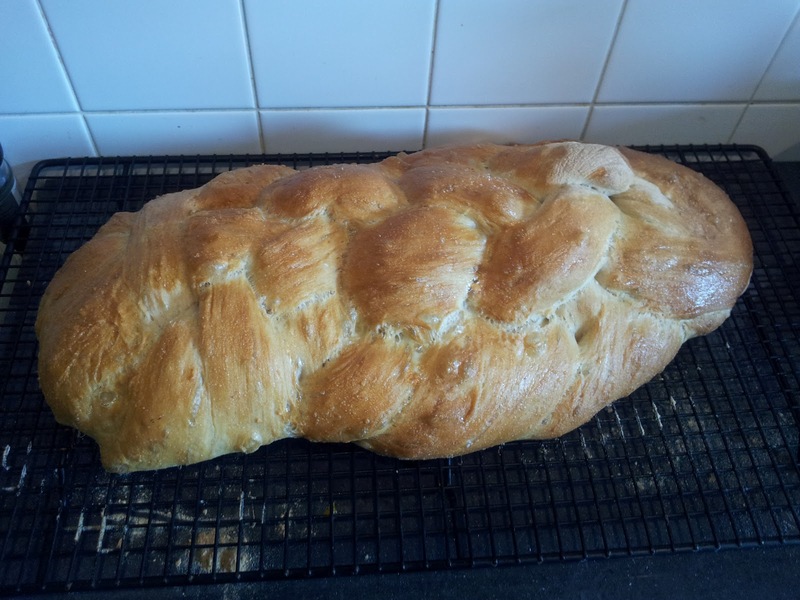 I've had a plaited loaf on my mental 'to-do-list' for the past year but just never gotten round to doing so. 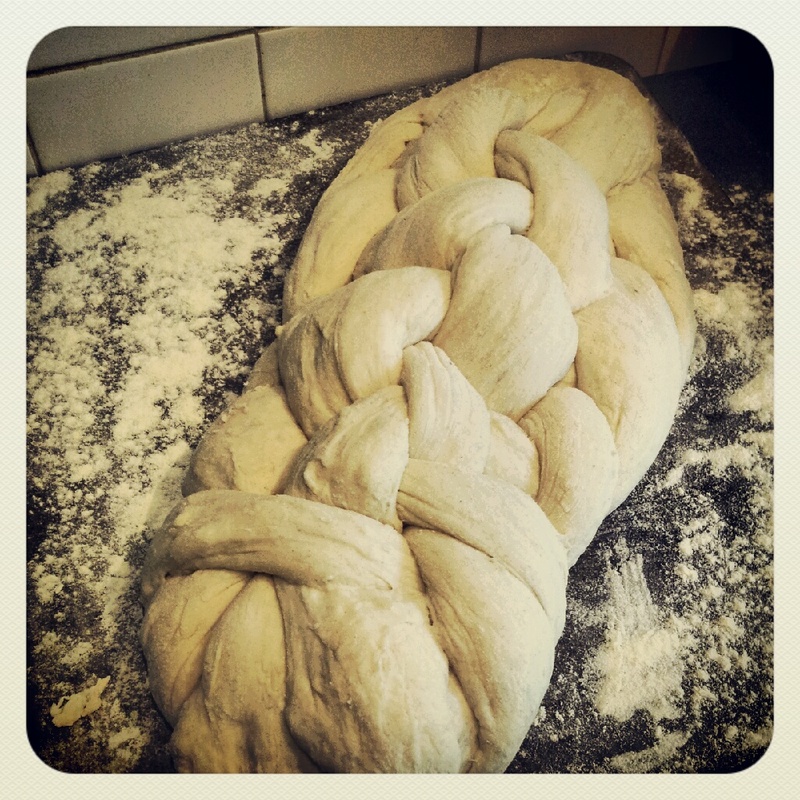 I'd intended to make Challah which is a similarly complex plait but with a slightly sweeter bread. 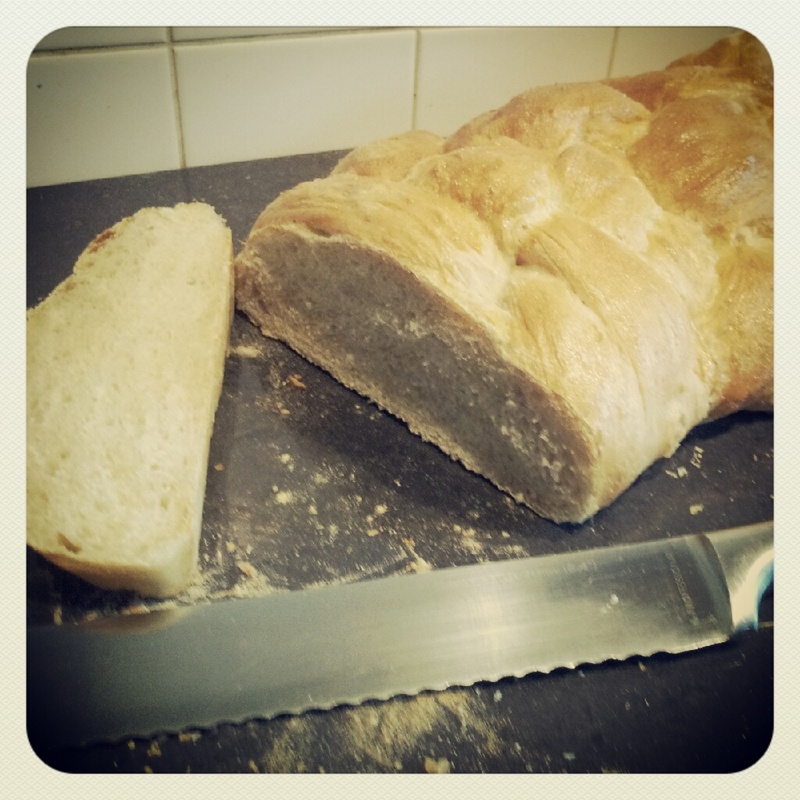 But I gave up on the 'Bread of the Week' idea in about week two and have just never gotten round to it. I picked the recipe for a number of reasons. One because it was the technical challenge on the Great British Bake Off this week, two because I've just been given a pile of plums and apples which I intend to turn into Dan Lepard's Plum Glitter Jam tomorrow (and the bread will be great to test the jam on) and three because....dammit, I'm sure there was a third reason and my mind has gone totally blank save for random Three Letter Acronyms from the Prince2 course I've just completed. Anyhoo, I was reading an article by The Silver Fox this week where he confirmed my previous assertions that there are just six basic baking recipes and everything else is a variation on a theme. If you look at sponge sandwiches, they all use the same sugar/butter/flour/egg ratio, the only variation is the tweaks in flavouring and the quantities depending on the size of your baking pan. Likewise with bread. It is flour, yeast, salt and water. Yes you can add loads of stuff to it; shape it differently; cook it differently; but at the end of the day, you still start out with the same basic ingredients and are ruled by the science of baking as to whether or not you get the perfect product. And so it was that I attempted the eight strand loaf this morning. It's a basic white bread dough but with double the yeast. This meant that within 45 minutes, my lovely pillowy dough was making a break from the confines of its bowl for the work surface. I knocked it back, tried to roll out my 'sausages' but it was just so stretchy and full of air that it kept shrinking back on itself. In fact, it would've made for an amazing pizza base. I had been surprised at the advice to use flour for kneading. Hollywood normally recommends oil as he says extra flour on the board or your hands can change the consistency of a loaf. In order to work with this very 'wet' dough though the flour was definitely needed. I eventually ended up with eight springy and rather uneven dough sausages and it was time to commence with the plaiting. Actually, it wasn't that hard to do. Yes, the instructions could've been better laid out. But if you can count to eight, it really isn't that hard. Sadly my uneven sausages made for an uneven plait. I've never been any good at rolling sausage shapes. Even back in the days of doing it with playdough as a child, mine were always mishapen and not perfectly smooth and wrinkle free like my peers were making. I also think my very soft dough conspired against me with the loaf ending up quite flat in shape after its second rise. I do have problems with my free-form loaves seemingly expanding more sideways than upwards. I could do with a tip or two from Sir Paul of Hollywood as to why this happens but I guess I'll probably have to end up asking Google. So I've done it. It baked okay and made an average loaf. Nothing to write home about. At the end of the day, it's a bog-standard white bread and I think my Giraffe/Tiger bread is more impressive than this. But next time I'm making a bog-standard white loaf, I may just give it another go if I can find out if it was because my dough was too soft. You can find the recipe/instructions here.